I’m still hands-on and like to make the time to see patients, get involved in outreach programs and customer service. 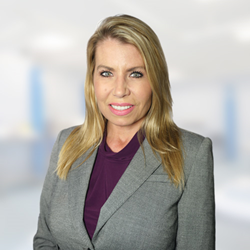 Physician Partners of America (PPOA), a national healthcare company headquartered in Tampa, has named Tracie Lawson, MBA, MSN, ARNP-C, as its first president. Lawson, who joined PPOA in 2014, has served as its chief operations officer since 2015 and will also continue to hold that title. She oversees daily operations and development of the company and its affiliates in Florida and Texas. Lawson earned a Master’s of Science in Nursing from the University of South Florida, and obtained her certification as an Adult Nurse Practitioner. She earned her MBA from the University of Phoenix and completed a master’s course in Private Equity at the London Business School. She is a Certified Healthcare Risk Manager in the state of Florida as well as a certified professional coder (CPC). Lawson takes the helm of the company founded by Rodolfo Gari, M.D., MBA, in the middle of a high-growth phase. In less than four years, PPOA has opened 21 interventional pain management practices, including five in the Tampa Bay area; five AAAHC-accredited ambulatory surgery centers; COLA-certified qualitative and DNA testing laboratories; a primary care practice; and practices in orthopedics, personal injury, psychology and Workers’ Compensation. In the early part of 2018, the company will begin performing minimally invasive spine procedures and add new pain management practices in Wellington, Jacksonville and Orange Park, Fla. It is also pursuing the medical pavilion model, which puts multiple physician practices and ancillary services in a single location. Lawson, a native of Clearwater, Fla., became interested in health care at a young age, entering a program at Clearwater High School that enabled her to become a Certified Nursing Assistant while still a student. Her interest in the business side of health care was sparked while working as a nurse for Dr. Gari’s first medical business venture, Tampa Pain Relief Clinic, in 2001. “He said if you wanted to grow in the business side of health care, you need to get a business degree,” she recalled. At one point, she was pursuing two masters-level degrees, in Nursing and Business Administration. Lawson joined Physician Partners of America in 2014. In true start-up fashion, she has jumped in to fill any role needed, including opening new clinics and seeing patients, while managing the company’s strategic growth. “I’m still hands-on and like to make the time to see patients, get involved in outreach programs and customer service,” she said. Headquartered in Tampa, Fla., Physician Partners of America (PPOA) is a fast-growing national healthcare company that manages a wide range of medical practices. These include interventional pain management, spinal procedures, orthopedics, psychology, personal injury, Workers’ Compensation, and AAAHC-accredited ambulatory surgery centers and procedure suites. Its ancillary division includes imaging, intraoperative neuromonitoring, medical supply distributorship, pharmacies, a COLA-accredited high-complexity quantitative toxicology lab and a COLA-accredited pharmacogenomics lab. PPOA was founded in 2013, on the idea of strengthening the doctor-patient relationship and improving patient outcomes by acquiring medical practices and employing partner physicians so they can focus solely on the practice of medicine. The company and its affiliates share a common vision of ensuring the safety and well-being of patients, and providing their physician partners the opportunity to focus solely on the practice of medicine.